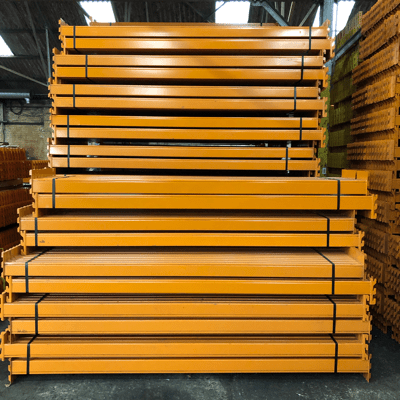 We currently have large stocks of excellent quality Apex used pallet racking, available in a range of sizes and duties. We have both blue and grey pallet racking frames, in heights up to 8400mm and in standard 900mm or 1100mm depths. All our warehouse racking frames are supplied assembled and with footplates attached. We have beams at 2300mm, 2400mm, 2700mm and a smaller number of 3300mm. All beams are supplied with beam locks. If you are looking to match your existing racking, please give us a call with the details and we will do all we can to supply compatible industrial racking. As well as Apex, we also have plenty of Link 51, Dexion and Redirack in stock. If you are looking for a delivered order, we cover the whole of the UK mainland and will always try to find space on scheduled vehicles to give you a great price. In the next couple of weeks we have part loads going to Newcastle, Ipswich, Somerset and Chester. Call us now on 0800 612 3210 for a quote, or use our handy enquiry form.